I’ll detail the basic recipe here and then show how it might be tweaked, and even tweaked for the better! The basic recipe has many common ingredients or types ingredients that many follow when making the dish or ordering it in a restaurant. It’s always pasta, usually spaghetti, with an egg mixture that includes a hard cheese like Parmigiano-Reggiano or Pecorino Romano. Pancetta, guanciale or procutto is often added, or even sausage. The egg mixture is then stirred into the very warm pasta just before serving, just before the heat of the pasta scrambles the egg mixture. The heat from the pasta should be hot enough to cook the raw egg. Parsley and a heavy dose of pepper are then added to finish the dish. The non-Italian version usually adds heavy cream to the egg mixture, while in Italy they use butter, lard or olive oil. 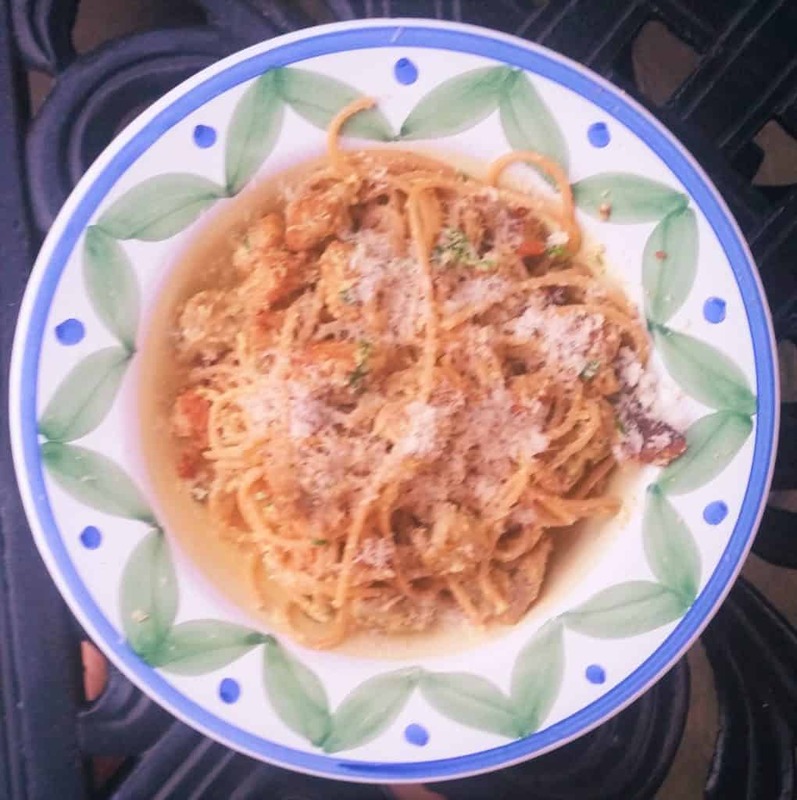 The origin of Spaghetti alla Carbonara in Italy is a leftover dish (probably). So, whatever might be around the next day is likely to have made it into the dish. The origin of the name is unknown. Some have guessed that is derived from the Italian word for charcoal burner “carbonaro”, a meal for charcoal miners. Or, simply, coal miner’s spaghetti. The name could have even been derived from the black pepper included in the dish. Regardless, it is usually thought to have been invented in from Rome or not far from Rome, where it is still a very popular dish. It may have even been inspired from American army troops (they had a lot of bacon and eggs) after WWII, or it may have evolved long before. I like the idea of its origin remaining a mystery, that way it gives you more freedom to tweak it to your own tastes! Of all of the different versions of this dish that I’ve seen over many years, my favorite and most inspired comes from British celebrity chef Jamie Oliver, in his “Jamie’s Italy” cookbook. Jamie’s very tasty inspiration includes lemon rind and sausage meatballs, love it! The best thing about this dish for me, which he calls Pasta alla Siciliano, is the larger portion of meat to pasta. This relatively high protein to carbohydrate ratio is what I prefer, but you can use less protein without harming the recipe. I’ve also tweaked Jamie’s recipe for my own tastes, as you can too for almost all of these ingredients. The basic components should include: some kind of sausage, bacon or pancetta cooked in a pan, to which cooked pasta is then added and, finally, an egg and hard cheese mixture added to the hot dish. 1 package of whole wheat pasta, typically 1 pound. Alternatively, use your favorite pasta. Note: I usually only use half the package rather than all of it as most recipes do. I find that half the package is more than enough pasta for me, you may like to add more though. So, to start this pretty simple meal, I start by preparing the ingredients. Sausage – slice open the casing of each sausage. 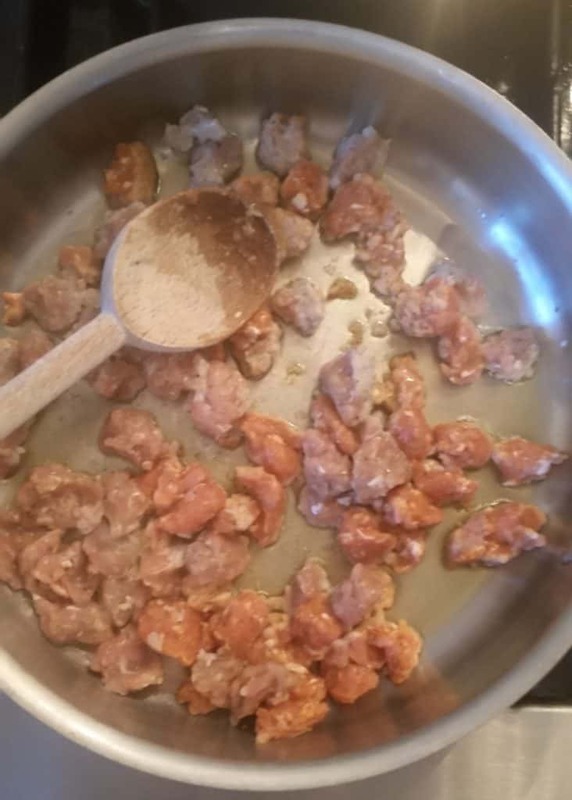 Then with wet hands (Jamie Oliver suggests this great technique), roll the sausage meat into small meatballs. Alternatively, you can just cook the sausage meat in a big pan, breaking it up as it firms. Chop the parsley, I use about ½ cup. 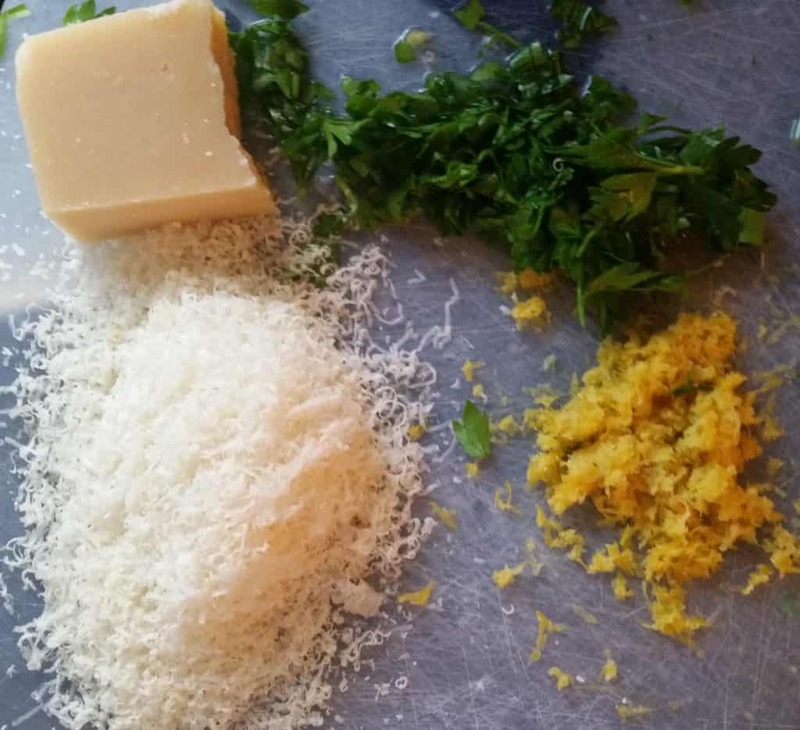 In a mixing bowl, combine four egg yolks, the heavy whipping cream, the lemon rind, all of the parsley, half of the parmigiano reggiano and salt and pepper. Then whip this mixture together until you see a lot of air bubbles, you can also use an electric mixer. In a large frying pan, I start the bacon, cooking it through and then add the sausage. The bacon and sausage grease is part of the dish so keep at least a part of it, even a tiny amount if you prefer. At the same time, start heating a large pot with a tablespoon of salt, until is boils for the pasta. Follow the directions on the package for cooking time and try to time your pasta cooking with your bacon and sausage cooking time. As soon as your pasta is cooked, drain the pasta mixture through a colander and you may choose to keep a little of the pasta water to add to the mixture. Add the drained pasta to the pan with the bacon and sausage and stir together. Then, turn off the heat, then immediately add the egg mixture. Stir the mixture throughout the pasta, bacon and sausage and it will cook the egg. Most recipes suggest preventing the egg mixture from becoming scrambled by adding some of the pasta water and removing the frying pan from the heat. I like to slightly scramble the egg mixture, not “scrambled egg” scrambled but just the very beginning of it. I just prefer a more cooked vs raw egg mixture. Purists may disagree, but that’s the beauty of this dish. Everyone can tweak it to their own tastes. I cook the eggs to my preference by adding the egg mixture at the same time as I turn off the burner, stirring continuously to make sure all of the egg mixture is in contact with the hot pasta, sausage and bacon. 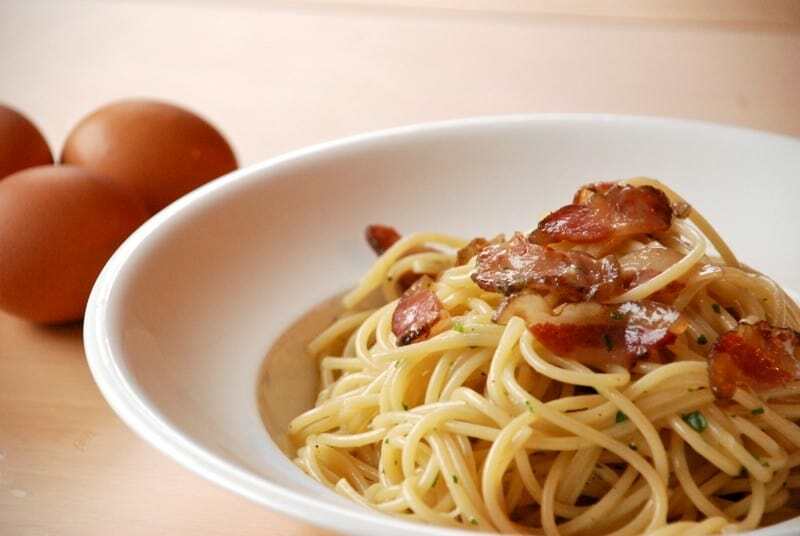 Now your spaghetti or pasta alla carbonara is ready to serve! This dish should serve up to four, depending on your appetite. I like to serve this dish in wide pasta bowls, you may also choose to serve on plates. Then add the remaining parmegiano regiano to the warm dish, add a little more pepper to taste. Hopefully you can see where you might in turn, tweak this dish to your taste. 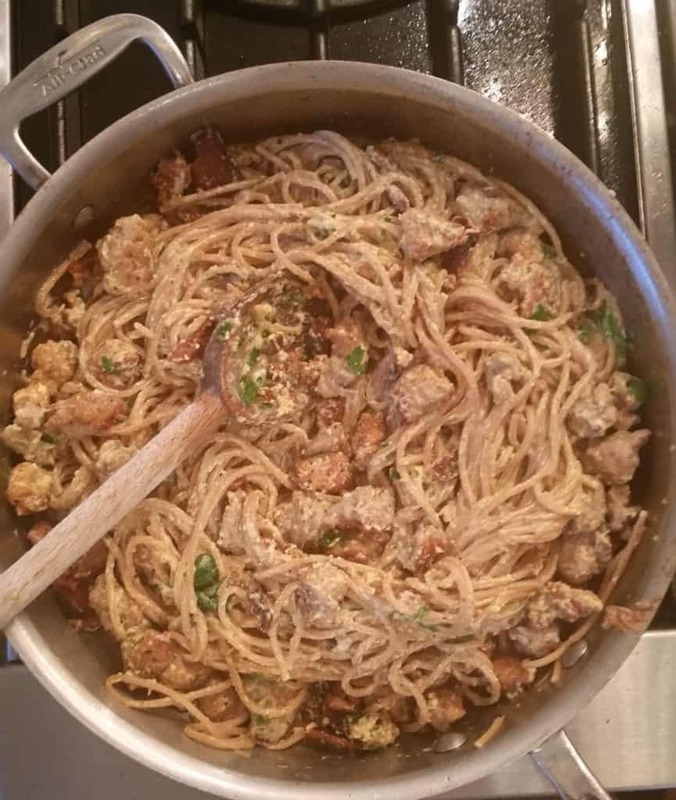 You might find a favorite mix of sausage, bacon or pasta that you like best, or just keep changing them with different mixes of all these things to give you and your guests or family a wide variety to this excellent dish. I think that the best thing about this dish is all the variation that it allows. So go create your own version! If you’re ready for a more traditional egg-based breakfast recipe then check out this recipe. This is an interesting variation of the original one. Great recipe. For a lower carb version, I substitute spaghetti squash for the pasta. Roast the split squash for about 45 minutes at 375 degrees. Follow the classic recipe thereafter and voila!